Editor ‘arris gets a new pair of Alpinestars Durban boots to test. Being a bit of a freak of nature I take a size 14 (US) boot. Now you’d think that this would be a happy freak of nature problem to have, but pretty well all boot manufacturers tend to stop at 13, making it somewhat tricky to get the boot I want. One of the few manufacturers to offer my sizing is Alpinestars, which is good news as I find Alpinestars stuff to be up there in the quality spectrum. Imagine my delight then when I got a press release for the new Scout waterproof dual sport boot – and an invitation to test a pair, to boot! Sorry. Sadly — and contrary to what I had thought about Alpinestars sizing — the Scout only goes up to a size 13 and even then the only pair that they had in stock was a size 11, so they shipped a pair of Durban Gore-Tex boots instead … size 13. Available in black (left) or champagne (right). The Durban boot is touted as a trail/tourer boot (the trail bit is specified as ‘light-trails’), which I guess makes it an adventure tourer boot – comfortable for all day use on pavement but with added protection for when you err off road. To be honest I’m not sure if this is exactly what I had in mind as I tend to err off-road quite a lot but then maybe it’s going to be a good test of just how far off road these boots will go. Maybe. Hey, it has adjustable buckles, so it’s gotta be good off-road, no? 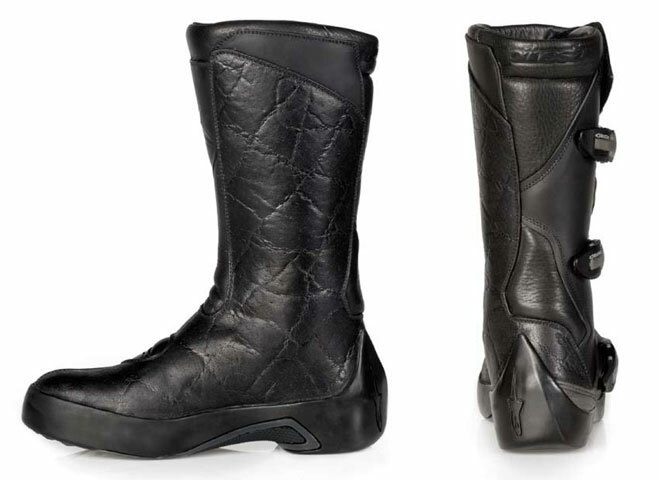 The tech bumf is quite assuring in this regard with added heel, toe and (some) shin protection, all covered in leather. The sole’s triple injected rubber (I assume that’s good) and although I see no mention of a steel shank (vital for cleated footpegs if you want to keep your soles comfy), the section of sole that rests on cleats is rock solid, so I assume it’ll give the support required. Sole has very hard and grippy insert in centre which should cope well with cleated pegs. Question is, how will that sole cope when pushing a bike out of the mud? Hmhh, slippery methinks. Of course, we’ll test them for that. The biggest claim (and one that I find is rarely true after a little usage) is that of 100% waterproofness. 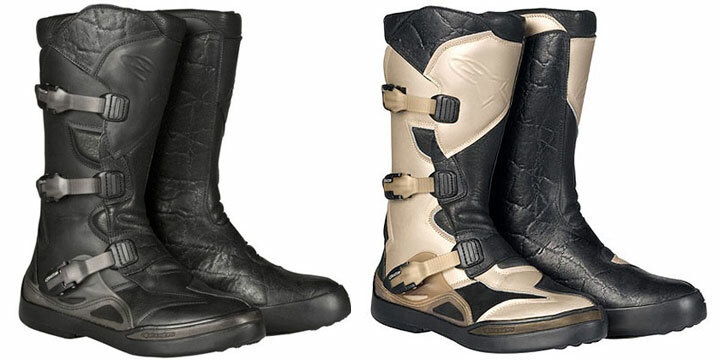 Alpinestars reckon that the boot’s breathable too, so we’ll also be looking at how they fair in hot as well as inclement weather too. Basically, it’s a do-it-all boot, which it should be considering the US$479.95 price tag (available in black or champagne black). But then if it can do it all, keep your feet comfy and dry and look good too then maybe it’s a price worth paying. albeit a bit on the snug side. Soft leather inner is what rests against the bike. Heel is reinforced for good support. As with all motorcycle boots I’ve had, initially they feel awful, so I took a few rides into town with an side excursion down some ATV trails. This was just enough to feel some give and so I decided to pack them up in my luggage to Montreal where I was to pick up our Honda CBF600 long termer and ride back out east. Hmhhh, an almost 1,000 km ride to be done in one day with boots that I’m hoping will be as comfy as the price tag suggests. Well, it turns out that they passed the first test with flying colours. Despite being a melon-burner of a 13 hour day, my feet remained free of sweat and comfy all day. They did prove to be a little stiff when off the bike, but then that wasn’t for much of the day and I assume they will break in more over time. So far, so good, but I wonder how they’ll work in the trails? He definitely said 13. I bought a pair of inexpensive size 13 Alpinestars last year and they were comfortable all the way to the Yukon and back over 21 days. I’d highly recommend the brand. I’m pretty sure they say 13. They do for sure say 48 Europe, which is the same as 13 US. The vid says they are available up to size 15!